New York recording artist De'Vigne was a tough hard singer, really gritty and low down. Judging by his discs that I know he definitely came from the bluesier side of town – just listen to the way he roars through Poor Boy, full of fire and pain. His performance on Things Ain’t The Same is even better, becoming almost hoarse as he screams out his frustrations. Both these sides feature strong guitar parts giving more credence to his R & B roots. 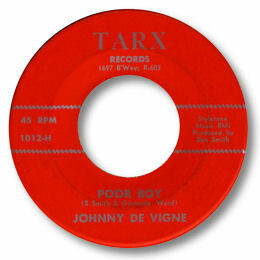 Johnny De’Vigne certainly didn’t become a star but his vocal prowess warrants a lot more notice than he’s been given. 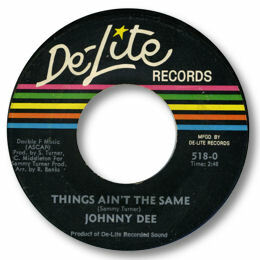 UPDATE ~ I am pleased to say I have found another 45 by the expressive and emotional singer Johnny De'Vigne - again under the name "Johnny Dee". Judging by the arrangment and style of the song I'd say that If I Thought She Didn't Love Me was a 70s release. 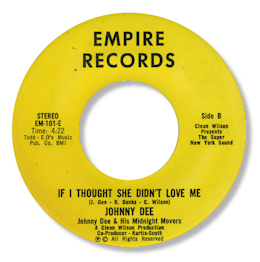 And although the rather laid back feel to the song brings it unconfortably close to the relams of MOR than I would like, as soon as Johnny gets into it you can forget about any problems in that area. The way he throatily tears the words out is right in the pocket, just as he was in his earlier tracks. Another fine 45 by the man - I wonder if there any more lurking out there. I hope so.